Wow, that is bad. Not sure why CNN would be so callous as to let him go during a time he needs some help (or rest, anyway). I've long defended CNN but man, I'm loosing a lot of respect for them. I wish they'd go back to their roots a little bit. Good luck to Michael Ware! I wish him the best wherever he ends up. I am shocked by this (granted, I actually didn't know about the PTSD so that contributes to my shock) and horrified that he was treated this way. And you're right, Cyn, no one is going to hear about it. This makes me so angry I could spit. Michael Ware is one of the best combat reporters I have ever seen and I hope he finds himself well and in greener pastures soon. Gorgeous tribute, Cyn. Sorry to hear this. 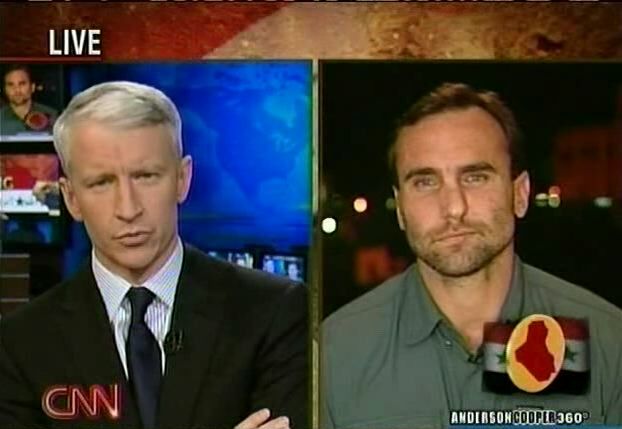 Whenever Michael reported, you felt you were getting the real story with no sugar coating--his in the trenches, raw reporting gave CNN some much needed credibility when it came to the wars in Iraq and Afghanistan--CNN has critics, but very few of them had anything negative to say about Michael Ware--he was considered that rare bright spot. This sounds like really bad and insensitive decision making on CNN's part. I hope Michael is able to get better and back to doing what he does best. Wow that's sad that Michael Ware is no long with CNN. I always enjoyed his reports. CNN has lost a great reporter. Its ashame they couldn't accommodate him when he requested more time off. He was a true asset to them and in time they will see what a mistake they made in not trying to accommodate him. "thinks" more is going on." I know you wouldn't put anything on that wasn't sourced through and through. Why does this not surprise me that CNN is this callous towards their employees and their needs? Just look at how they've USED Anderson to promote everyone else. CNN is in one word "sickening." Phebe, have you and your bloggers considered checking your facts? CNN has issued a statement saying that Michael is NOT leaving CNN. You look totally ridiculous now. "With regard to Michael Ware, CNN has been and continues to be very supportive. Any issues regarding his contract remain confidential between Michael and CNN. On the wider issue of PTSD, CNN is rightly regarded as an industry leader in this area. We offer outstanding help and support services to employees, past and present, in this area." Hmm, funny... I don't see any mention of him not leaving. They don't even say he is still with them right now. I stand by what I wrote. While I don't know whether they are the "industry leader" or what the industry standards might be, I do know that when he asked for more time, they declined to allow it. Their -- and our -- loss. How is CNN treating Anderson Cooper? He has been through hell and back. I have not seen him live on AC360 for awhile.I hope CNN is treating him with the respect and mental/physical support he may need after being in haiti for so long. CNN better be very careful with Mr. Cooper, if he leaves that may be the last straw for alot of CNN viewers.